Certain colors evoke moods and emotions within us. For instance you wouldn't want to paint your bedroom yellow because it is equated with wakefulness and the conscious mind, but blue on the other hand is very peaceful, as is purple. In this section of the online grimoire, I have listed colors and their meanings or correspondences. These are my own personal uses, many I have borrowed from other sources, others are truly my own. Please feel free to use this list however you wish, or copy it down and add whatever you feel to it. I, as always, encourage the reader to experiment. 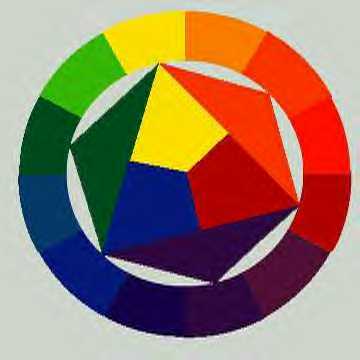 If you see a color that is not here use the knowledge you obtain here and make your own judgements. Also, this is worthy of some note, especially if you wish to add your own: Sometimes, but definately not always, the warm colors are associated with masculine energy and cooler colors with female energy, but there are also neutral colors, and so on and so forth. Then we have the vibrational energy attributes of colors. The deeper darker colors (Indigo, deep purple, burgundy red etc) resonate with a deep steady vibration, while the brighter colors on the opposite end of the spectrum (bright yellow, fire engine red, hot pink, etc) have a fast pitched vibration to them. Don't worry about all that right now. The more you work with color magick the more easily all this will come to you. Now, on to the colors! Yellow: The color of the element of Air; Conscious mind, clarity of mind, intellect, wisdom, communication, if you are studying for a test light a yellow candle. Wakeful color, paint your kitchen yellow as this is one of the first rooms we walk into when arising in the morning were we make our breakfast and our cup of coffee. Yellow is cheery and is reminiscent of sunflowers. It is a Solar color. Gold: Gold is the color of riches, prosperity, fertility, and the harvest, I also associate Gold with the Father God (Think: "Amber waves of grain") because the grain fields are golden when they are harvested at their fullest point. Color of High Kings, nobility, and warrior types. The Celts would embrioder geniune gold filligree into mantles (the broach that pins the cloak to the tunic). Orange: Harvest color also (think gourds, pumpkins), good luck for the year to come. Energy, attraction, stimulation. Red: Fiery Passion. Loss of innocence (think maiden transforming into mother goddess), deep love. This is the color of fire element and elementals, the creative and destructive force of fire, exorcism. Chinese culture also regards the color Red as being a good luck color. Pink: Sweet love, innocence, fertility, friendship, kinship. Brown: Some consider brown a cool color as it is a color of the Earth, but others consider brown warm because it is really just very dark orange. Brown is an alternate Earth element/elemental color, and also used for magick for animals, and I associate it with the dying God, or as some call him the Sage, because after the grain (father God) is harvested, all that is left is the Earth. Blue: This is the color of the water element and elementals. Light to dark--Light being less intense and dark being more intense of the color blue: Healing, peace and serenity (light blue), psychic mind, sub conscious (med blue), Super conscious (dark blue), meditation, life-giving and life taking properties. Purple: Majestic and noble, and once prized as a cloth dye because of it's rarity (and only obtainable by kings or those with a lot of money), commonly used by clergy in robe-wear, purple's associates are with the psychic mind, spirt contact, spirituality, today as a gay-pride color, occult power; light purple (or lavender): spiritual healing, peace, sleep. Green: Fertility, growth, healing, money matters, luck, gardening, green faeries, I also associate green with the youthful God because of the associations with Green and springtime. Green is also the color of Mother Earth, and earth elementals and elements. Also eco magick, any earth magick, nature magick, etc. Silver: Full moon color denotes Goddess in her fully pregnant mother aspect. White: Purity, virginity, innocence, meditation, general magick, also may be substituted for any color. Black: Absorption, mystery, the void, nothing but yet everything, binding. Colors! Interesting link I found with the rainbow myth based on native american myth, and a meditation to see what colors FEEL like! Also their interpretation of colors and meanings.